They just don’t get it, how many more times do I have to tell them? If they won’t do what’s required then they have to go, I can’t be doing with them here. It’s so simple, why don’t they see it; do they have no common sense? I can’t carry on like this; they are either for us or against us! A familiar rant, I’ve said it myself about some problem or other. But what is going on here? ‘Not getting it’ sounds pretty final, the person in question must be pretty hopeless, or are they? What does ‘they don’t get it’ actually mean? Well, it may be that the individual is incompetent without the drive or the capability to do what is required of them. But spare a thought for another possibility, maybe ‘they don’t get it’ means they don’t see the world in the way that I do. You have made your sense of a situation and so for you it has become common sense but maybe not for them. I’ve just heard on Radio 4 news about our tendency to view China from a western perspective and how that may be blinding us to what is actually going on. Our ideas about “common sense” clearly don’t fit theirs. I want to open up the idea that the business world is not such a simple and straightforward place as we may sense or want it to be. Or even, for those who see business as complex and difficult, we may still be looking at the world through our own particular lens which may be blinding us from other perspectives that can help us run our businesses better. It’s much to do with how we think, out mindset and the ways in which we see the world. 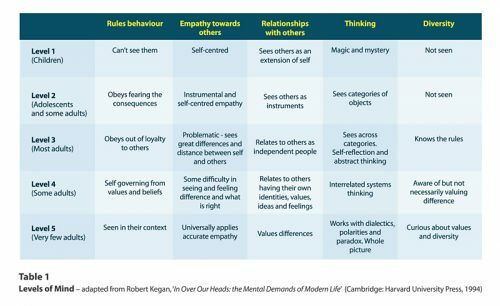 Robert Kegan from Harvard (1) defined five levels of mind that he sees as driving the human capacity to adapt to the demands of life in relationships, families and also within organisations. (See Table 1). The first level is typical of young children, the second of adolescence, the third of most adults, fourth is of some adults and five is of very few adults. It is in the fifth level where we see the characteristics of the truly wise manager. At this level, Kegan talks about the ability to incorporate dialectics, polarities and paradox in one’s thinking. Let’s look at some practical examples of what this means. I joined a group of senior executives on a visit to a newly acquired company in the food industry. As we passed the processing lines, the talk was about how much more the staff were paid than the acquiring company’s equivalent staff. In the despatch area, it was the angle of the pallets and the speed at which staff were moving about. One lone voice was asking questions about different routes to market, pricing, the competition, and the external environment in which this company operates. This lone voice was drowned out by the voices reflecting on the cost synergies built into the acquisition plan and how the acquired workforce would have to adopt the ways of working of their new parent. Both perspectives were valid and in fact either party was capable of seeing the situation from the others’ perspective, (ultimately). However, both became fixed for an initial period on their respective pair of spectacles and were blinded to that of the other. What I witnessed was strong level three thinking, most thinking across the categories of operations and efficiency and the other thinking across the categories of sales, marketing, revenue generation and channels to market. 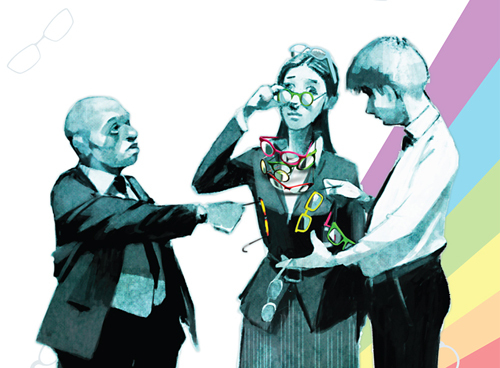 The two different pairs of spectacles looking at the same thing resulted in different sets of actions being proposed. So what do your spectacles look like? How do they compare with that of your colleagues? Where are your blind spots? Senior management is full of the need to look at different perspectives. Some are additive – as illustrated in the example above we need to look at both revenue and cost, it’s not an either or. We need to adopt level four thinking about the total system of the firm. Other situations we deal with require more level five thinking because we have a dilemma, a paradox or two elements in tension with one another. For example, we often say that we value openness but there is much we cannot say. The parent company is considering closing us down, do we tell everyone or should we keep our council, argue our corner and only communicate once a decision is made? Is this discretion or deception? How does this fit with our value of openness? Another example of these tensions is that we all recognise that we need to be fully engaged in the business and demonstrate our passion yet at the same time have to consider a potential closure. We know if we give any indication of the parent’s intentions then the likelihood of closure increases so we hold our tongues. Is this being straight? Is this authentic? Part of our passion is projecting a sense of certainty of the future of the business, we have inner doubts but should we express them? Our perspective so often has to be elastic, helicoptering up to see the context one moment, diving deep to understand critical detail the next. We have to consider the past, present and future. As we fly our metaphorical helicopter through time and space we encounter forces and issues in opposition to one another, we need to understand them all yet decide on one. Leadership is indeed a complex web of forces; many opposing or conflicting one another, so that we have to constantly balance and position depending upon the situation. The art of leadership is the art of managing dilemmas and paradox. George Orwell coined the idea of ‘doublethink’ to describe accepting two mutually contradictory beliefs as correct; it is doublethink that managers have to hold. We have to drive forward relentlessly to achieve a goal whilst holding the possibility that it may not work out… and that is when plan B will be required. To effectively lead multi-national, complex businesses in a rapidly changing world, Kegan’s being “curious about values and diversity” is then critical. Telling us that it’s ‘all simple’ shuts off the multiple, relative perspective; our ability to see the world through different sets of spectacles simultaneously. Dividing the world into ‘us‘ and ‘them’ is what psychologists call ‘splitting‘. Going back to Kegan’s levels of mind, he sees splitting as a characteristic of children under seven. But seeing other perspectives, working with dilemmas is not just about putting up with it. Simon Schama makes an interesting distinction between tolerance and toleration (Woolf Institute lecture, 2011). Tolerance is to do with empathy, being able to put yourself in other people’s shoes, see life from their point of view or at least acknowledge that it is different. Toleration is more the act of putting up with difference without having any genuine insight into it or desire to understand it. Political correctness is toleration, doing it because either you fear the penalty of retribution (level two) or because of loyalty to others / the organisation (level three). Tolerance is a universal and accurate empathy with other people, the ability to see differing perspectives and putting yourself in their shoes. This does not imply giving up your own view or opinion, but it does mean recognising, respecting others’ perspectives and how those perspectives link and bridge to your own. I started off by talking about dilemma and have ended up on diversity. Diversity is not just a social good, it is the means of making better sense of the world and making better decisions. It is not just about how you behave, it is about how you think, it is the way that we embrace the uncertainties and complexities of our business futures. From my own recent experience working with senior teams facing tough organisational issues, this is increasingly a relevant topic. We need to make a greater investment in developing how we think and our levels of mind if we are to optimise difference for the greater good of our organisations and the people within them. Managers are hungry for the sort of guidance we provide and in many cases open to reaching beyond their current thinking patterns.